Foreign exchange option, in terms of finance, represents a derivative instrument used by currency owners to exchange their currency to another on a pre-established date and at an exchange rate which was agreed before. This instrument, also known as currency option or simply FX option gives the currency owner a right, but not a obligation of exchanging currency at preset rates and dates. The market for foreign-exchange options is the largest, deepest and also the most liquid of all options market that exist. Most of the tradings are done over the counter or OTC and there is light regulation involved, but there are options on futures contracts traded in Philadelphia Stock Exchange, the International Securities Exchange and Chicago Mercantile Exchange. Call option – gives the right for buying an asset at fixed price and date. Put option – gives the right for selling an asset at fixed price and date. Foreign exchange option – gives the right for selling money in one currency, then buying money in another currency at relative price and fixed time. Strike price – the price of the asset at which an option can be exercised by an investor. Spot price – the asset price in the moment of the trading. Forward price – t the asset price for delivery at a certain point in the future. Notional – how much of each currency the investor is allowed by the option to buy or sell. Ratio of notionals – the strike, not the forward or current spot, but the strike. Non-linear payoff – considering the underlying currency, a straightforward foreign exchange option payoff is linear and the payout is denominated in a given numéraire. Numéraire – the asset’s value expressed in a specific currency. What makes foreign exchange options different than traditional options is the right of selling or buying stock, non-money assets or a commodity given in exchange for an amount of money in the case of traditional options. 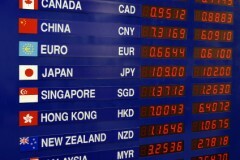 Foreign exchange options involve the same type of trade, only in a different currency. Take the example of oil options: a call option means that the investor buys the oil at a specific date and price. The one who sold the oil actually sold a put option. Residual risk can be eliminated by matching foreign currency notionals instead of the local ones. or the received and delivered foreign currencies don’t offset. Foreign exchange options are used by corporations mainly to hedge future cash flows that are uncertain in foreign currencies. The general practice is to use forwards for hedging those cash flows in foreign currencies which are certain and to use options for the foreign cash flows which are uncertain. If a foreign exchange contract is used for uncertain cash flows, then the firm gets exposed to foreign exchange risk in opposite direction, considering the possibility of not receiving the USD cash that was expected. Options risk exposure is calculated using various techniques or Greeks, as it is the Vanna-Volga method. Every model produces option prices which agree, but the risk numbers may differ a lot depending on volatility surface, interest rate curves, assumptions used for spot price movements properties. The Garman–Kohlhage model is one of the most common models, along with the local volatility and SABR. However, the Garman–Kohlhage model is always used to agree the risk numbers with another counter party. All those dealing with foreign currencies need to have a good idea of what hedging currency risks mean. A business which operates with foreign currencies is automatically exposed to a number of new risks such as interest rate risks, exchange risks or the valuation exposure of foreign exchange and so many others. In order to reduce the risks that come along with foreign exchange trades, hedging currency risks is something one needs to learn. Hedging currency risks means that the risks produced by price changes of currencies against the others are either negated or just reduced. Concretely, if you had an amount of dollars payable within two months and you made all the plans depending on this and the dollar happens to appreciate with respect to the home currency, on the moment the payment is due, you’d be actually shelling out more.